Was just wondering if my tailpiece is too short. Is my tailpiece too short? Dose it really matter? And if it dose matter, is it 'really' worthwhile getting it down to 54.5mm? Hi John, afterlength is a debating issue, so however your violin sounds to you is more important. My experience, just IMO, is that 60mm for most Strads is in its fuzzy zone. My suggestion, if you like to try, is if you're using synthetic core, getting it to 328mm, a bit more south, and getting that afterlength close to 57mm to see how it sound to you. Good luck, John. LOL, you don't need luck, right? 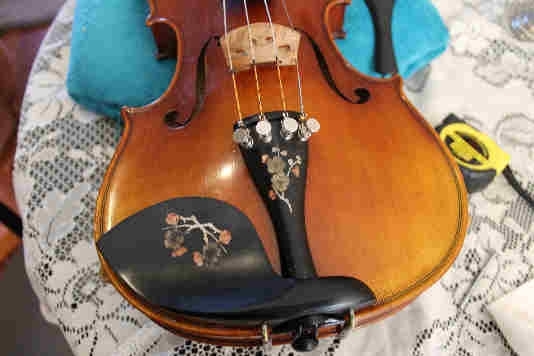 I asked because I noticed that the measurements where not quite right and a have a very nice mop inlayed tailpiece that is the right length that matches the inlay in my chin rest. Im tempted to switch the tailpiece. Is suppose I could change back if I'm not happy. Since your after length is long, just take the tail piece off and adjust the gut out about 5 mm. then put at back together. there should be threaded ferrels on the gut. I changed it and it came out at 329 and 55. Darn close to standard recommended. Perhaps it sounds a little 'brighter' but with the Larsen Virtuoso strings it sounds good. For some reason the string 'action' seems a little lighter. I don't know why it should. Could be my imagination. I've also lost an annoying little 'ring' on the open A that i used to have. The tuners on the tailpiece are the ones that keep the strings in the same place as not using them. Personally I can't see any reason for the action to feel lighter but the important thing is that it feels right. Did you change to new Larson strings or you just put them back on? Those are incredible strings BTW. I have never reviewed them but I have tested them and believe they may be the best strings available. Too bad they are so expensive. "mop" ... I thought it was a typo in chat, but it kept recurring ... I guess there's something to it, ha ha. mop=MOP=mother of pearl, for any who are only slightly more clueless than me.